American crows are large black birds about twice the size of a blue jay, with a length of 15.8 to 21 inches. Males and females look alike and have black legs and bills. Males and females are also about the same size, weighing between 11 to 22 ounces. Fish crows are similar but slightly smaller and are found only along major river systems in southern Illinois. 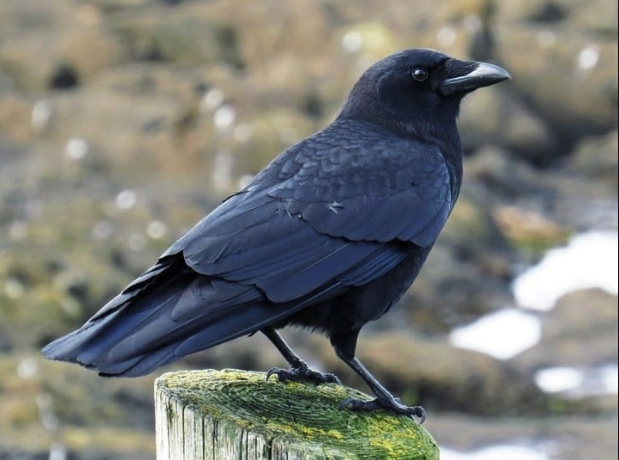 Check out the Cornell Lab of Ornithology All About Birds website about American crows for audio clips, ID info and life history. American crows are common to abundant throughout Illinois and are year-round residents. Crows from northern states will migrate to northern Illinois for the winter, while crows in northern Illinois fly south to central Illinois. In the spring they return north. In the winter it is common for large groups of crows to gather together in urban areas where it is slightly warmer than the surrounding countryside. The flocks disperse in February when the crows begin to pair up for the breeding season. American crows are intelligent and very social. Flocks of crows are called “murders”. They typically make a loud “caw-caw” noise, particularly when disturbed or alarmed, but they are skilled mimics and can make vocalizations that sound like laughing, crying or a dog whining. They can often be found together harassing hawks or owls. 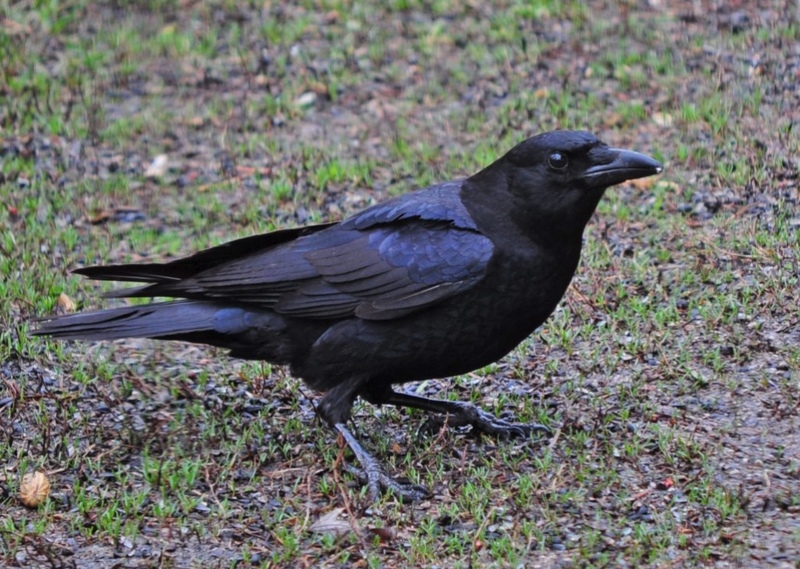 American crows are very susceptible to West Nile Virus. They do not spread the disease directly to people, but they do play a role in the life cycle of the virus. 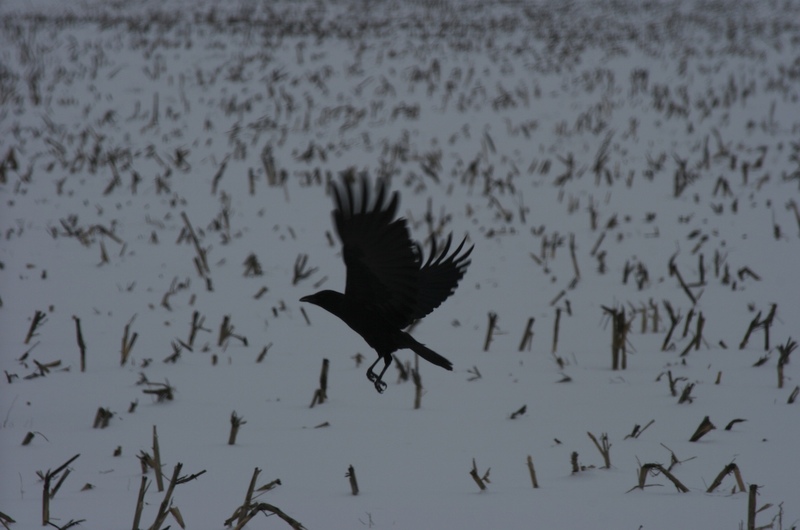 American crow taking off from a winter corn field. American crows are highly adaptable and can be found living in many habitats including cropland, woodland edges, forests, and urban areas. They are opportunistic feeders and are known to eat berries, seeds, insects, small mammals, reptiles and amphibians, other birds’ eggs or young, and carrion. The nesting season occurs March through May. The male and female build the nest together and share incubation and brood rearing duties. Their large nest is made of sticks and built 10 to 70 feet up in a tree. The female lays two to seven greenish blue to pale blue eggs blotched with brown or gray. American crows have only one brood per year, and it is common for young of the previous year to help their parents raise the new brood. Since they are habitat generalists, habitat modification has little effect in deterring crows from using a site. Netting can be used to exclude crows from high-value crops or small areas. In small home gardens you can protect ripening sweet corn by covering each ear with a paper sack until after the silk has turned brown. Widely-spaced lines or wires placed around sites needing protection may have some success in repelling crows. There are no registered repellents or toxicants for use against crows in Illinois. In cases where large numbers of crows gather, frightening devices are useful. Frightening devices include recorded distress calls, pyrotechnics, various sound-producing devices, lights, high-pressure water spray and, where appropriate, shotguns. American crows are protected in Illinois and may not be removed with a permit. CONTACT your local Illinois Department of Natural Resources district wildlife biologist if you think removal is necessary. American crows are federally protected by the Migratory Bird Treaty Act. They are also protected by the Illinois Wildlife Code. They may be hunted by those with a hunting license and habitat stamp from late October to late February from a half hour before sunrise to sunset with no limit to the number that may be taken. Click HERE for full hunting regulations.